It’s just always about the base, right? At the moment, I’m enjoying a good mix of old favourites and exciting new additions – anything that fakes flawlessness and lasts a full work day will always be a winner in my eyes. I’ve spoken about this a few times before, but I still love the Hylamide HA Blur for its skin-smoothing abilities without any greasiness. 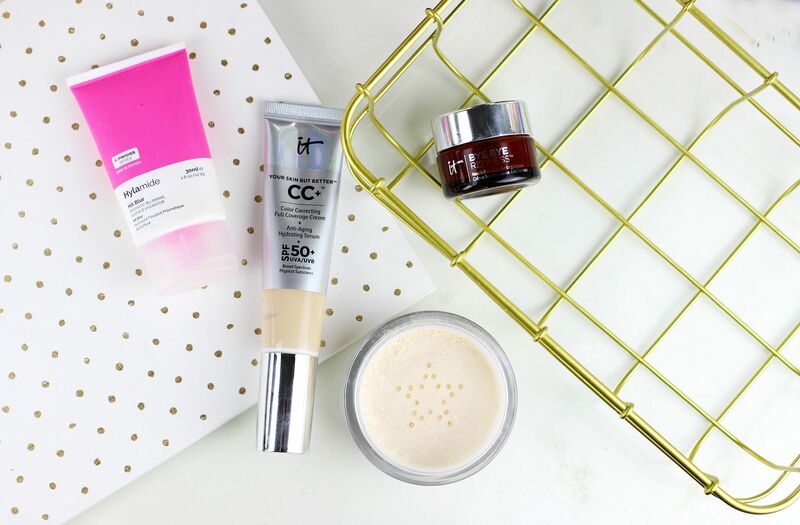 I use a tiny bit every morning on the centre of my face and it acts a nice pore minimiser. Two from It Cosmetics – the Bye Bye Redness, which is a really thick paste that nicely eliminates any redness. It looks similar to the Kevyn Aucoin sensual skin enhancer but is far more malleable. I always correct the redness in my skin, and this does a beautiful job. I’m also loving the Your Skin But Better CC cream, which gives good glow. I love using this, and it also works well with a tiny bit of the mac prolongwear foundation mixed in to make things last even longer. It’s a nice mix of looking natural and having coverage. I find it hard to get too excited about powders – they’re more finishers than something spectacular in their own right. I use them to pro-long my hard work in terms of my base so while they’re a vital part of my routine, powders are rarely glamorous. This one, the Kat Von D Lock It Setting powder, is a nice change though. Silky smooth and very finely milled, it sets foundation really well and does a good job.